Author Lisa M. Russell has a passion for microhistory – intense investigation of niche historical topics. In “The Dress,” she talks about the surprising inspiration behind one of literature’s most well-known characters. Read on to learn more about Senator Rebecca Latimer Felton, and her connection to the famous Scarlett O’Hara! I finally found her. She was at Oak Hill Cemetery in Bartow County, Georgia. I was doing research for my first book, Lost Towns of North Georgia, when I spotted her. Her grave was not elaborate, considering who she was. I wanted to say something to her, but all that came out was, "Thank you, Senator. Thank you for everything you have done for me and every American woman." Rebecca Latimer Felton was sworn in as the first female U.S. 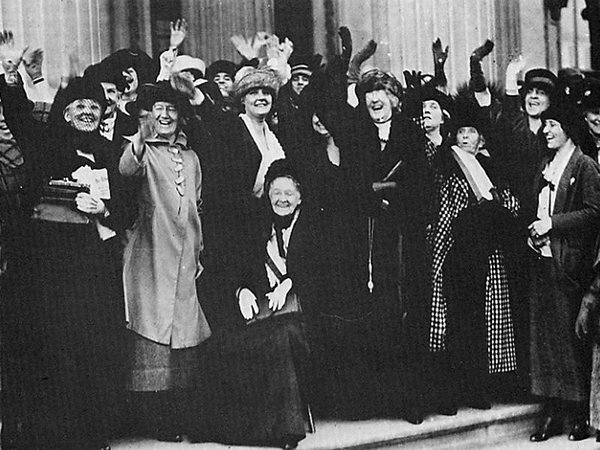 Senator on November 21, 1922, only 27 months after the 19th Amendment, which gave her the right to vote, was passed. Felton, appointed by a politically motivated governor, served only two days in the Senate. However, her political career began 40 years earlier. Mrs. William H. Felton was her husband’s congressional assistant, drafting bills and writing his speeches. She gave speeches for the women’s vote, prison reform, and temperance. Since she often made trips to Atlanta from her Northwest Georgia home for work, Rebecca felt she needed a new dress. So she made one. 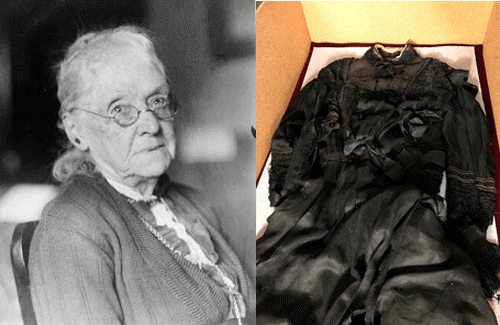 In desperation of what to wear (still typical of women today) and not having time for a trip to Atlanta, [Senator Felton] took her curtains from the window and dyed them black. She then made the dress, added the lace ribbons and fringed tassels, turning it into this lovely creation. It is all handmade, which she wore over a full black taffeta petticoat. This dress was the inspiration for one of her best friends, Margaret Mitchell, when writing Gone with the Wind. It has been told that Scarlet O’Hara was patterned after Rebecca Felton. Senator Rebecca Latimer Felton, and the dress she made from her own window curtains. Mitchell’s characters are her own creations, but the similarities between O’Hara and Felton are undeniable. Mitchell, a young reporter for The Atlanta Journal, would have known Rebecca Felton, since Mitchell was 22 years old when Felton was sworn in as the first female senator. Rebecca was certainly a role model for Mitchell, and possibly a friend. In her book Scarlett Rules: When Life Gives You Green Velvet Curtains, Make a Green Velvet Dress, Lisa Bertagnoli asks, “What is it about curtains and strong women?” In More than Petticoats: Remarkable Georgia Women, Sara Hines Martin says that Rebecca was warned to “avoid collisions…. She went for it headlong and full force…[and] ruffled many feathers with her aggressive behavior.” I can almost hear Mammy warning Scarlett, “It just ain’t right Ms. Scarlett!” as she forced her way into the business world and into the hearts of taken men. Later, when asked about the theme of Gone with the Wind, Mitchell said, “What makes some people able to come through catastrophes and others, apparently just as able, strong and brave, go under? I only know that survivors used to call that quality ‘gumption.’ So I wrote about the people who had gumption and the people who did not.” When Rebecca Felton returned to her war-ravaged home in 1865, sick, hungry, and poor, she declared, “I will never be poor again!” Sounds like movie dialogue. An inaugural photo of Senator Felton. I was working in the archives of the University of Georgia when I found an old picture of an ancient woman, dressed to the nines, staring straight at me – almost as if to say, ‘I dare you to discover my story.’ All I had was a name, Rebecca Latimer Felton. What I discovered was one of the most remarkable women in American history, and a story so turbulent and filled with drama, it seemed like fiction. The story of Rebecca Felton is kept alive by historians and authors who celebrate her incredible memory. Like so many of the influential women in history, her story is seldom told. However, her influence in great works of art is alive and well, and her tale continues to be told by a most unusual medium: her beautiful curtain dress. Note: Did you know that while other states have elected women senators to congress, there has never been another woman to be elected in Georgia to the US Senate? Lisa Russell is a member of the Society for Georgia Archaeology, Bartow History Museum and Etowah Valley Historical Society. She earned her masters degree in professional writing from Kennesaw State University. When Lisa is not teaching at Georgia Northwestern Technical College or Kennesaw State University, she can be found exploring North Georgia through a micro-historic lens. If you’d like to see more of Lisa’s work, check out her books below! Did you know about Senator Felton’s connection to Scarlett O’Hara? Let us know in the comments!